Car Back Seat Hand Grip / Auto Head Rest Handle / Hanger Hook and Orangizer for Bag, Cloth, etc. [CAR005973] : Onchee.com - the accessory shop for all your handheld Electronics! Home >> Auto Accessories >> Hangers / Hooks >> Car Back Seat Hand Grip / Auto Head Rest Handle / Hanger Hook and Orangizer for Bag, Cloth, etc. This item is manufactured with premium material for durable and long lasting use. It is designed to help provide balance for children as well as elderly and heavier adults. It can easily convert your car's headrest into a convenient storage space to hang groceries. Keep your car clean and keep people safe. 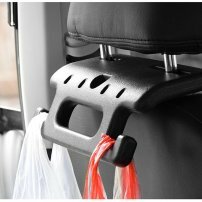 - 2 in 1 Function --- Not only as a back seat Grab Handle, but also a good hangers, you can hang up your shopping bags, backpacks, clothes and so on. - Special Design for Them --- A quality and practical safety grab handle for the elderly, pregnant women and recovering patients to get on and off, and it helps people balance their body when the car is rocking and bumping, sharp turn, and sudden braking. - Universal Dimension --- The maximum diameter of the headrest column is 0.55 inch, and the distance between columns is 3.8-6.0 inch, which is suitable for more cars. - Very safety --- The hooks of the product is on both sides, This design is unlike other similar products on the market(The hook is forward), which will not cause injury to the human body when emergency braking occurs. - Use Premium Material --- This car accessories is made of high quality durable ABS, it can withstand 330lb of pressure. It is environmentally friendly and can be used for a long time.